While browsing the internet, sometimes we face the problem with ads. Few websites show too much ads. And the problem seems bigger if there are floating ads and pop-up ads. I prefer to avoid these websites. But what if you want to block such kind of ads completely. You can block all kind of ads on any website. It means, you can browse internet ads free. If you are using Google Chrome, you can use adblock plus Google Chrome extension for this. Download this from Google Chrome Web Store and add to your Google Chrome browser. Once, it is installed, it will show adblock plus icon in omni bar. Now you surf the internet and browse websites. You will not see ads any more. This extension blocks almost all kind of ads even on Facebook. Suppose if you want to allow ads on a website, just visit the website and click on omnibar icon. Here, click on the first icon saying “Enable on this site.” Clicking on this will disable adblock plus on this site and you will start seeing ads on this specific website. If want to disable adblock plus on more websites, you can either visit all those websites one by one. 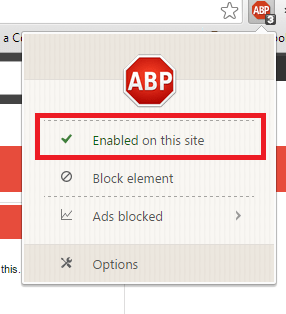 Or just click on the options in the context menu of adblock plus to visit options page. 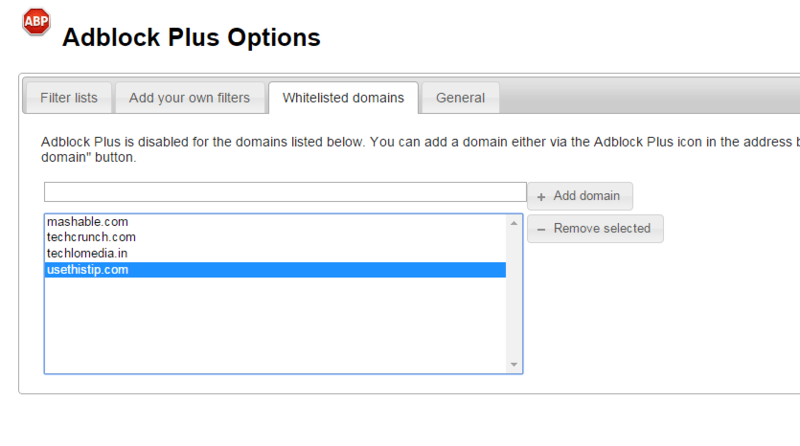 Here, you can create a whitelist of all domains on which you want to see ads. Therea are few other options in this adblock plus options page. You may find it interesting. But I do not think that these are as much useful to explain in this article. Now you know how to use adblock plus to block ads on any website. Note: Bloggers like me rely on ads revenue to live the life. So, please add my website in the whitelist to allow me run ads and my life both. Thanks.